A few years ago, there was a show on TLC called Take Home Chef with celebrity chef Curtis Stone. He made the most amazing food on the show. One of my favorite things he made was a Yorkshire Pudding. 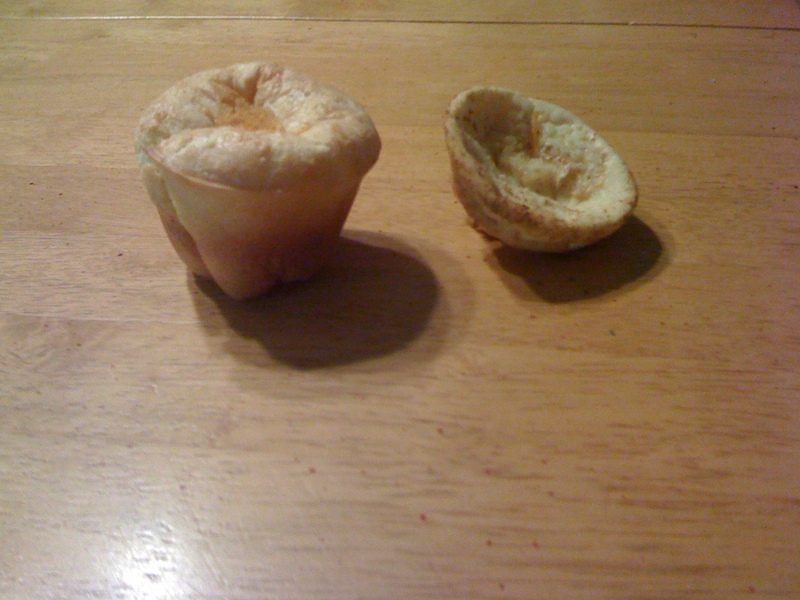 I didn't have a popover pan and read that you really should have one in order to create beautiful Yorkshire Puddings. Guess what!?! Over the weekend, my mother-in-law gave me a few baking pans and among them was a popover pan! So I found a recipe and gave it a try. Preheat oven to 375 degrees F. In a blender, combine eggs, milk and flour and give it a whirl. Set aside. Divide the beef drippings among 12 cups and place in the oven to heat up for 3 minutes. Remove from oven and pour batter evenly among the 12 cups filled with beef drippings. Bake in oven for 5 minutes at 375 and then reduce heat to 350 and finish baking for 20-25 minutes until puffed and golden brown. So just to test the necessity of a popover pan, I baked 6 in the popover pan and 6 in a regular standard sized muffin pan. I would definitely agree with the article I read. The 6 in the muffin tin stuck like crazy. 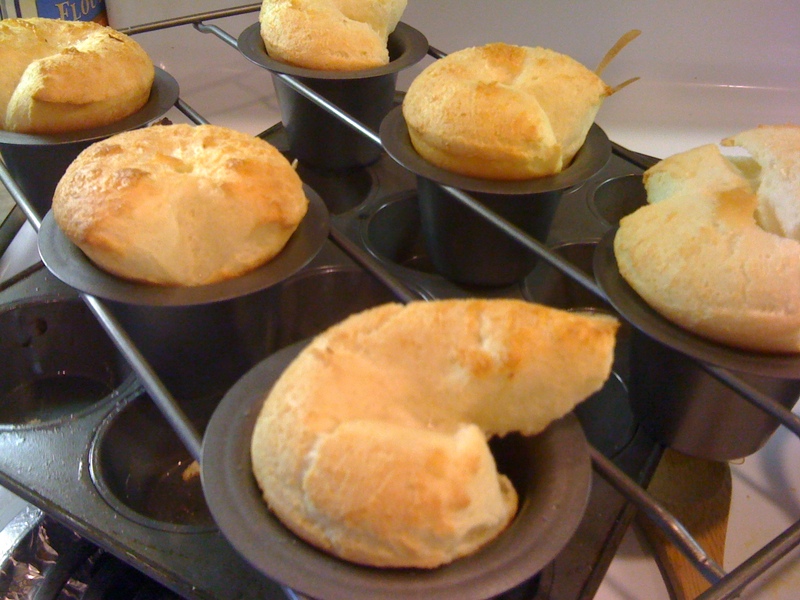 The one in the popover pan puffed beautifully and didn't stick. I made these to go along with our Beef Roast and used them to soak up the beef broth and goodness from the pot. Holy Moly are these things good! Love Curtis Stone! These look yummy! Might be a good reason to buy another kitchen gadget! ;) By the way - congrats on growing those luscious baby carrots! 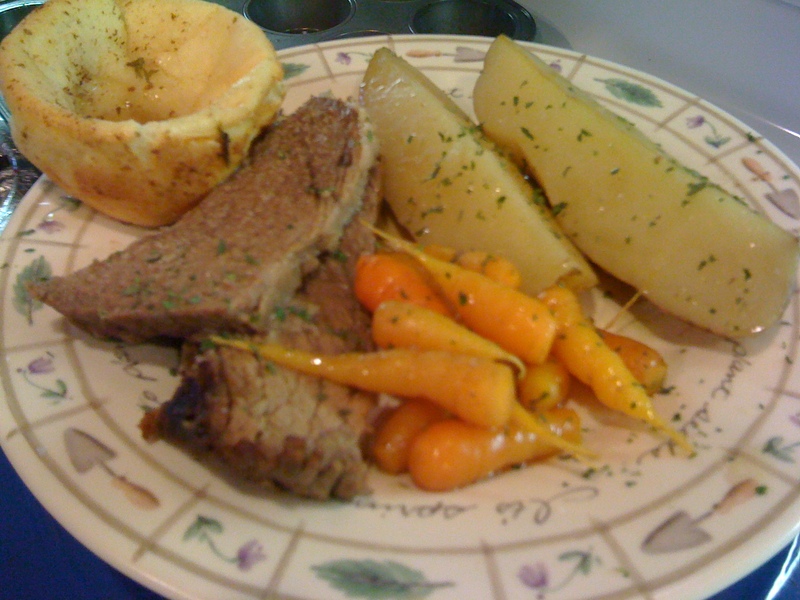 Hubby LOVES yorkshire pudding, I will definitely be making these!